HighTechScience.org's The Jetson's "Rosie the Robot"
"Rosie the Robot" was the electronic maid and housekeeper on the TV show "The Jetson's". The show was a prime-time animated sitcom that originally aired from 1962–1963 and again from 1985–1987. 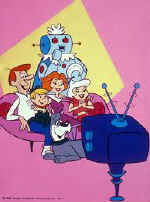 The Jetsons lived in a futuristic era of elaborate robotic contraptions, aliens, holograms, and whimsical inventions. Rosie was an old demonstrator model purchased by the Jetson family. Her original factory model number was XB-500. The original 24 episodes of The Jetson's aired Sunday nights on ABC from September 23, 1962 - March 3, 1963. It was re-run on Saturday morning for decades. At the time of its debut, it was the first program ever to be broadcast in color on ABC-TV (as The Flintstones, while always produced in color, was broadcast in black-and-white for its first two seasons). Its continuing popularity led to further episodes being produced for syndication between 1985 and 1987. In 2006, Rosie appeared in an AT&T TV commercial and in 2009 Rosie was used in an Australian commercial. Rosie The Robot was the inspiration behind the formation of the First FRC Team Rosie Robotics in 2002. HighTechScience.org owns several "Rosie the Robot's" including the 2010 Hallmark Special Edition version which speaks several lines from her stint on "The Jetson's".